Even though most of the infrastructure plans outlined in the latest Land Transport Masterplan were announced in the run-up to the Punggol by-election in January, the document is admirable for the way it maps out methodically what Singapore needs to do to keep its population moving up to 2030. But a masterplan requires more than just hardware. It needs to spell out more qualitative targets, rather than focus on quantitative ones such as the length of rail network and number of buses. It needs to get to the crux of what leaves commuters satisfied: service quality. While the plan spells out issues such as service frequency and reliability, as well as walking distance to and from a train station or bus stop, the proof of the pudding goes beyond that. There is a need to look at how crowded it can get, the quality of air-conditioning, train speed (which has been patchy of late), station dwell time, dependability of services such as lifts and escalators, and even noise level on trains. The plan needs to deliver that lofty promise touted famously by a leading airline - "making sure you arrive in the best possible shape" - if public transport is to have any chance at all competing against the car. Here, the goal is to make public transport a choice mode, rather than a mode of no choice. To do that, there needs to be a slight shift away from an engineering-centric way of meeting an objective and measuring how successful we have been doing so. But that does not mean diminishing the importance of engineering. In that respect, the quality of infrastructure needs to be nailed down, since this will eventually determine its reliability and longevity. In light of recent rail breakdowns, it appears that there are still struggles with water leakage in tunnels - an issue faced by builders since the Central Expressway opened more than 20 years ago, despite improvements in construction material and technology. These leaks appear to be the root cause of many MRT incidents, including at least two tunnel fires and tracks that corroded barely three years after a new line was opened. If leaks are indeed unavoidable - as claimed by the Land Transport Authority - then it must be made sure that water is channelled safely away from all operating parts such as rails and cables. And if such parts cannot be placed out of the path of water, then at least ensure that they are water-resistant. There is little point stating that Singapore's infrastructure specifications meet international standards - each geographical region poses its own set of challenges. So engineers here should specify standards that are suitable for local conditions - just as car makers 'tropicalise' models meant for hot and humid markets. It is true that it is the responsibility of operators to ensure operating assets are well-maintained and flaws are fixed quickly. But that responsibility becomes much more onerous if an infrastructure is prone to one form of failure or another in the first place. Singapore pays top dollar for its infrastructure. So it is reasonable to expect a high level of robustness. Another area that needs overhauling is a transport framework that suffers from the tension arising from profit-oriented operators providing a public service. It is now clear that publicly listed operators face opposing values of satisfying shareholders and commuters. While it is in their commercial interest to keep operating assets in good running order, they may be tempted to delay repairs and upgrades for as long as possible. Or do the barest minimum. 'Softer' measures of service quality, such as crowdedness or efficiency of air-conditioning, matter even less. So Singapore needs to move swiftly to a regime where the Government takes ownership of all operating and fixed assets, and, preferably, assumes revenue risk. The operator would then be tasked with focusing solely on meeting a clearly laid out set of service standards - without worrying about the bottom line, because their profit margins would already have been fixed. An effective carrot-and-stick regulatory system will then ensure that the welfare of commuters is prioritised. Any masterplan also needs to be stuck to. One way to ensure this is to have longer stints for ministers and permanent secretaries. Former Transport Ministers Mah Bow Tan and Yeo Cheow Tong outlined ambitious rail projects during their terms. Mr Yeo told Parliament in 2000 that Singapore would have 540km of rail lines by 2030. But only now are some of these projects being built; and we will have only 360km of rail by 2030. A plan in 1997 to upgrade the signalling system of the North-South and East-West MRT lines - which would have allowed trains to run at closer intervals - will be completed only in 2018. If those original plans were adhered to, our transport infrastructure would have kept pace with the population boom. As it is, the rail expansion programme listed in the Land Transport Masterplan 2013 may be merely playing catch-up, as Singapore continues to grow. It does not help that some of the new lines are three- or four-car systems - unlike the six-car models in the country's older lines, and eight-car or scalable systems found in some cities. Finally, this may be time to re-examine two even more fundamental assumptions about transport - that public transport is good and private transport is bad; and there is a need to keep increasing supply to meet demand. To start, we can stop demonising cars, which play a crucial role in any land transport landscape. With fast-emerging technologies such as autonomous vehicles, they might even become more efficient than public transport. With an average occupancy of 20 percent today, a bus may not be more efficient than a car during off-peak hours. Especially when a bus consumes far more fuel and far more road space. The second assumption of building more and more to meet demand is fallacious too. Consider how Singapore's population has grown 110 percent since 1981 but the number of trips (excluding cycling and walking) has spiked by more than 360 percent to 12.5 million a day. Since people commute primarily because they have to, and not so much because they want to, this exponential growth in trips is a tad worrying. If the trend continues at the same pace, it may not be sustainable - economically or environmentally - to keep building more infrastructure to cater to demand. We need to find a better way. And that may require urban and transport planners sitting down together to improve accessibility, and not just mobility. The way we live, work and play on this little red dot also needs tweaking if Singapore wants to avoid the maladies of a mega- city. And that will involve more mixed-use developments, flexi- hours, tele-commuting, walking and cycling. 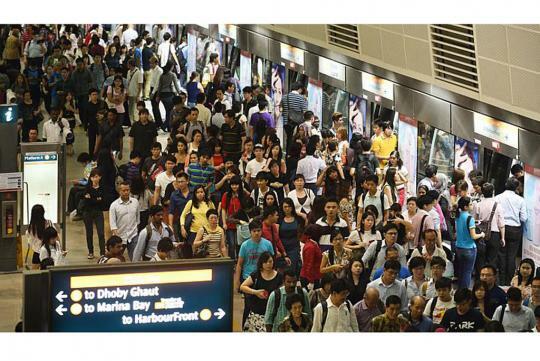 If LTA thinks by adding more train stations across Singapore will ease the bottleneck in the current crowded stations, they will be in for a shock soon. All it takes is fast forward to 2020, with estimated population of say 6.0m, and just take one station, say Orchard station and peak hour. Currently its very packed with 5.4m people, by 2020, there will be more people squeezing into this station just purely by ratio. What LTA needs to do is to expand the station capacity and not just increase more trains and stations because it doesn't distribute away the human traffic away evenly. By 2020, there will be more people wanting to go Orchard.